Inspiring shows, lots of sunshine and 42.000 enthusiastic visitors from home and abroad. 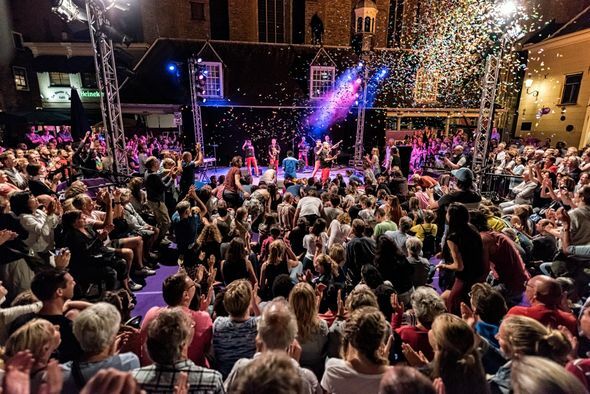 The seventh edition of Spoffin, the international festival for professional outdoor theater in Amersfoort (NL), included 167 performances at 17 different locations in and around the historic city center. One of the highlights this edition was undoubtedly Asuelto, the intense and intriguing new performance by dance company HURyCAN (FR / AR). Many people also enjoyed the show Lullaby by the young Portuguese clown Rui Paixão and musician Carlos Reis (theatre project Cão à Chuva). Les Frères Troubouch (BE) and Zirkus Morsa [FR] were also highly appreciated by a wide audience. Spitfire Company presented Antiwords in former convent Mariënhof and sold out two of the three nights. Visitors were impressed by the act about power, manipulation and by the actresses drinking lots of beer. Cie. Woest (NL / BE) worked on their new act Lucky Shots during the Spoffin residence and showed this as a work-in-progress after three weeks intensive research. ‘We didn’t expect to get so many positive reactions,’ Paulien Truijens of Cie. Woest said. ‘But after our first performance on saturday different festivals offered us a next residency too or invited us to perform.’ Programmers attending the festival also showed their interest in booking De Jongens (NL) and HURyCAN after seeing their performances in Amersfoort.